Fr. Bernard Haring was considered by many the greatest progressivist moral theologian of the 20th century. Although persecuted under Pius XII, he was rehabilitated by John XXIII, who quoted Haring in his allocutions on morals. He participated in Vatican Council II as a perito and played a significant role. He was also a good friend of Paul VI. Author of about 50 books on Moral Theology, he taught in the Redemptorist University in Rome from 1950 to 1986, when he retired after difficult bouts with cancer of the larnyx. Notwithstanding, he continued to travel around the world giving talks to spread Progressivism. "Fr. Bernard Haring, 80-years-old, has a dream. Before he dies, he would like to read a pastoral letter of a John XXIV at the beginning of the 3rd millennium. What does this mean? It is simply a way to express Haring's hope that the Cardinals of the Holy Roman Church will elect a pope who will call himself John XXIV and continue the work of the Pope of the Council. "The new Pope's mission would be to write a pastoral letter to all the citizens [of the world] to announce the changes he would like to make in the Church: the abolition of ecclesiastic titles, the Cardinals' purple, and the diplomatic corp of the Holy See. Thenceforth, it would be forbidden to call the Pope 'His Holines' or the Cardinals, 'Your Emminence.' Further, women should have the same rights as men and be able to ascend to the priesthood .... In brief, these are the thoughts of Fr. 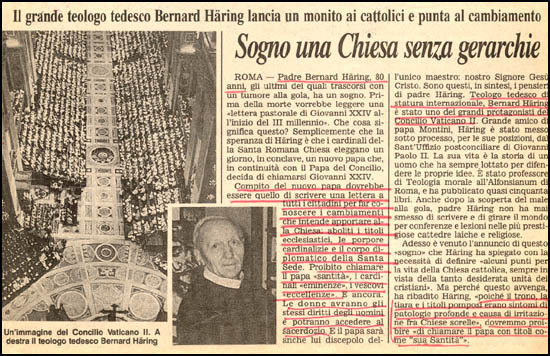 Bernard Haring, German theologian of international stature and one of the great protagonists of Vatican II. "Now comes a report of this 'dream' which Haring proposes as a means to define 'some points for the life of Catholic Church in order to achieve unity of Christians.' He explained that 'since the papal throne, the triple crown, and the pompous titles were symptoms of a deep pathology and cause of irritation among our sister-churches,' we should forbid 'calling the Pope by the title of His Holiness.'"